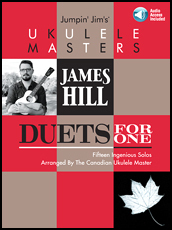 Duets for One is a collection of 15 ingenious solo arrangements by Canadian ukulele master, James Hill. Each arrangement is comprised of two distinct parts—melody and accompaniment—that you'll learn to play simultaneously on a single ukulele! The 15 songs include classics by George Gershwin, Irving Berlin, Hank Williams, Coldplay and others. Arranged for reentrant GCEA tuning, all songs include ukulele tablature as well as music notation and most can be performed with a simple thumb-picking technique. The price of this book also includes access to online recordings by James Hill of all the arrangements for download or streaming, using the unique code on page one.